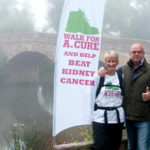 We are delighted to invite you to take part in Walk For A Cure, although it is focusing on walking in May, you can arrange a ‘Walk for A Cure’, any time of the year, to help raise funds for research and to support kidney cancer patients, carers and their families across the UK. You could walk with a friend, start a walking group or if you are a rambling group, create a unique event. 9 great events across the UK, for a wide range of fitness levels and you can choose whether to walk it, jog it or run it. In October of 2010 kidney cancer patient and fundraiser Adrian ‘Ade’ Cure was a guest speaker at our President’s Dinner at the House of Lords. He was a proud, strong, determined man and raised over £30,000 for kidney cancer, most of which was donated to us, before he died of kidney cancer in March 2011 after a four-year fight. In memory of Ade and all he had achieved, his brother-in-law Andy Coleman and Jane (Ade’s wife in picture on the left) organised the ‘Walk for A. Cure’ fundraising event, and were determined to smash the £10,000 fundraising target set, they raised over £18,000 to support the kidney cancer community. You can walk as far as you wish, by yourself or as a group!